Malaria is a serious health issue in Indonesia. Mosquito control is one aspect of an integrated malaria management programme. To focus resources on priority areas, information is needed about the vectors and their habitats. This research aimed to identify the relationship between anopheline mosquitoes and topography in West Timor and Java. Study areas were selected in three topographic types in West Timor and Java. These were: coastal plain, hilly (rice field) and highland. Adult mosquitoes were captured landing on humans identified to species level and counted. Eleven species were recorded, four of which were significant for malaria transmission: Anopheles aconitus, Anopheles barbirostris, Anopheles subpictus and Anopheles sundaicus. Each species occupied different topographies, but only five were significantly associated: Anopheles annularis, Anopheles vagus and Anopheles subpictus (Java only) with hilly rice fields; Anopheles barbirostris, Anopheles maculatus and Anopheles subpictus (West Timor only) with coastal areas. Information on significant malaria vectors associated with specific topography is useful for planning the mosquito control aspect of malaria management. Malaria is a life-threatening disease in Indonesia with an estimated 15 million cases and 42,000 deaths annually [1–3]. Malaria is transmitted by Anopheles mosquitoes. Of the 24 Anopheles species recorded in Indonesia, ten are major malaria vectors [4–6]. These include: Anopheles aconitus, Anopheles balabacensis, Anopheles barbirostris, Anopheles farauti, Anopheles koliensis, Anopheles letifer, Anopheles maculatus, Anopheles punctulatus, Anopheles subpictus and Anopheles sundaicus . The most extensively occurring malaria vectors in Indonesia are An. sundaicus, An. subpictus, An. barbirostris, An. maculatus, An. aconitus, and An. balabacensis [5, 7]. Anopheles sundaicus is associated with coastal, brackish water and is widely distributed from Sumatra through Java to Bali . On Sumatra, however, it is regularly associated with fresh water . Species recorded as important in Java include: An. subpictus [10, 11]; An. 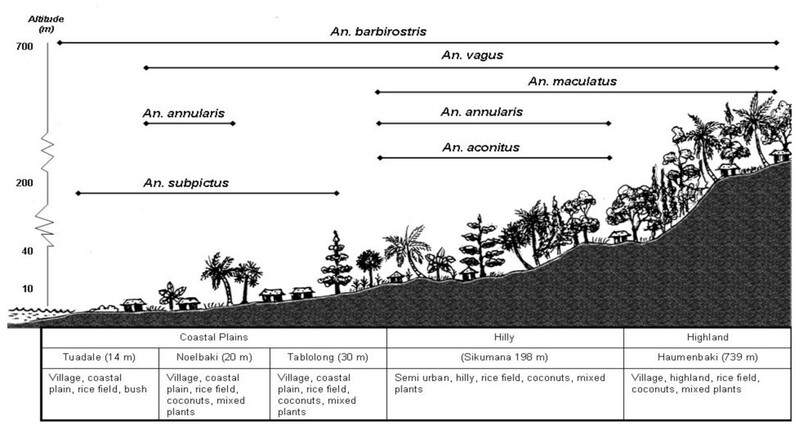 aconitus, associated with rice-paddies, [8, 10, 12] and, in Central Java, according to Barcus et al , An. sundaicus is the dominant vector in coastal areas, and An. aconitus and An. barbirostris are often found in the coastal plains area. In hilly areas, An. maculatus and An. balabacensis are dominant. In Kalimantan, An. balabacensis is associated with forest  and is also recorded in western Sumbawa Island . Anopheles punctulatus, An. farauti and An. koliensis are the main vectors of malaria in Papua [16, 17]. Habitat preferences of the immature stages are indicative of the areas in which adult mosquitoes will be active. The larval wetland habitat may be temporary or permanent, and natural or man-made, and each species is associated with specific habitats . Many of the factors important to mosquito development and survival, such as meteorological conditions, vegetation, water body characteristics and land use may be related to topography (mainly landform and elevation) and Sandosham and Thomas  suggested that Anopheles habitats may be divided into three main topographic zones: brackish-water zone, coastal plain, and hills and mountains. The aim was to characterize the relationships between anopheline species and topography in West Timor and Java, Indonesia. Ten villages (five in West Timor and five in Java) were chosen to represent different types of topography adapted from the habitat information provided by Sandosham and Thomas . These were coastal plain, hilly (rice fields), and highland areas. The villages were selected based also on their pattern of malaria, the availability of local assistants and access constraints. The areas were in West Timor, West Java and Central Java (together referred to as Java) as shown in Figure 1. The villages, selected by topographic types and land use, are shown in Table 1. West Timor has one of the highest incidences of malaria in Indonesia . In Java malaria is not considered to be endemic in Sukabumi District, although there was a malaria outbreak in 2003 [20, 21]. In Kebumen, Central Java, there are several persistent pockets of malaria transmission [13, 22, 23], and malaria incidence in the Kebumen District is high relative to other locations in Central Java . There is very little seasonal variation in climate of the study areas. However local meteorological conditions are important to mosquito activity. Maximum and minimum temperature, relative humidity and wind speed were checked during the study periods to ensure that conditions were suitable for mosquito activity. A total of 49 mosquito surveys were conducted from June 2006 to March 2007; 25 in West Timor and 24 in Java (12 in West Java, Sukabumi and 12 in Central Java, Kebumen). Table 1 summarizes the surveys. The adult captures were from landing rates. This was considered preferable to light trapping for two reasons. First, it would capture host-seeking mosquitoes (important to malaria transmission) and second, it did not require special equipment. Adult mosquito landing collections were conducted indoors and outdoors in the villages in each topographic type. The surveys were conducted fortnightly, based on the method recommended by WHO [25, 26], and described below. Adult mosquitoes were caught when landing on human volunteers' bare legs or hands during the night. For this research, ethical clearance was obtained from Indonesian Ministry of Health. Four to six people (depending on the location) were employed to catch these host-seeking mosquitoes. The collectors were divided into indoor and outdoor groups. Both indoor and outdoor catches were carried out generally from 6 pm to 6 am at one-hour intervals. The landing collection was conducted for forty minutes, followed by ten minutes collecting mosquitoes resting on the wall in the house, and outdoor-resting mosquitoes in animal enclosures. The last ten minutes were used for collectors to rest and change positions. To avoid collector bias, each collector was rotated into different location on an hourly basis. The collectors were equipped with torches: aspirators and paper cups were used to catch and store the mosquitoes. The collections were identified to species level based on the identification key to female Anophelines of Indonesia provided by the Indonesian Ministry of Health . The data were recorded as frequencies for each species by location and topographic type. Chi-squared analyses was used to test the relationship between mosquito numbers, location (Java or West Timor) and topographic type (coastal plain, hilly, highland). Although highland areas were slightly cooler, the differences in meteorological conditions were not so great that they would inhibit mosquito development or flight. The mean minimum temperature was 21.8°C (SD 3.4), mean maximum was 26.3°C (SD 2.7); mean minimum relative humidity was 71% (SD 9) and the mean maximum was 87% (SD 5). Wind speed was less than 2 ms-1. Table 2 summarizes the numbers of mosquitoes caught for the eleven species by location (West Timor or Java). Of these, four species are considered to be especially important malaria vectors : Anopheles aconitus, An. barbirostris, An. subpictus and An. sundaicus. A total of 7,189 mosquito individuals were caught, of which 77% were in Java, with eleven species present. The remaining 23% were in West Timor with large numbers of An. subpictus (an important vector). Table 3 shows the Chi-squared results. The null hypothesis is rejected in five cases and the research hypothesis that there is a significant relationship between a particular species and topographic type is accepted. the use of a dash (--) indicates that the contingency table was too sparse to permit analysis. Anopheles annularis: this species was numerous in Java but not in West Timor. In Java it was strongly associated with hilly rice fields. Anopheles barbirostris: in Java this species was strongly associated with highland areas, whereas in West Timor it was associated with coastal areas. Anopheles maculatus: this was found almost exclusively in coastal areas of West Timor. Anopheles vagus: this species was predominantly found in hilly rice field areas of Java and it was also associated, with fewer numbers, with coastal areas. It was not common in West Timor though its distribution was widespread. The other species showed no significant relationships as identified by the analyses. This was related to relatively small numbers (leading to low expected values) for An. flavirostris, Anopheles indefinus, Anopheles kochi, An. sundaicus and Anopheles tesselatus. Anopheles aconitus, while a significant malaria vector, showed no relationship because it appears to be widespread and indiscriminate in its habitats. In West Timor, An. subpictus was the most abundant species (65.5%), and was found only in coastal areas (Table 2). Species with widespread distribution from coastal to highland areas in West Timor were An. barbirostris and An. vagus (Table 3). In Java the most abundant species were An. vagus and An. aconitus (Table 3). Anopheles maculatus and An. sundaicus only occurred in coastal areas, whereas An. annularis, An. indefinitus, An. kochi and An. subpictus were captured only in hilly rice field areas. In terms of topographic type coastal areas were the preferred habitat of An. barbirostris and An. subpictus in West Java, whereas in Java hilly areas were preferred by An. annularis, An. subpictus and An. vagus, as well as possibly An. indefinitus, though the latter was not statistically significant. To provide a picture of the findings from this research the topographic/land use relationships for the mosquitoes of West Timor and Java are shown schematically in Figures 2 and 3. Sub-species or species complexes occur in some anopheline mosquitoes and their vectorial capacity at that level is uncertain. This aspect was beyond the scope of the research reported here, but may be relevant for further research. Although fewer mosquitoes were collected in West Timor than in Java (23% of the total) 81% of these were known to be significant malaria vectors (An. aconitus, An. barbirostris and An. subpictus, with the latter very numerous). The abundance and wide occurrence of An. subpictus is likely to be a significant contributing factor in West Timor's high incidences of malaria. This is relevant to planning the type of mosquito and thus disease control. Thus if a vector species is concentrated in wetlands in coastal areas, for example An. subpictus, there may be the potential to combine methods including predators such as fish with low toxicity larvicides. Where species, such as An. aconitus, are widespread such focussed management may not be effective. In that case broad scale larviciding (or adulticiding) may not be cost effective and one option is to encourage the use of protection such as bed nets, screening and wearing long garments. In all situations, providing relevant public information is a cost-effective way to reduce the risk of exposure to disease vector mosquitoes. Such information would be based on knowing the vector habitats and also their diurnal activity patterns, so that humans can avoid contact at particularly risky times. Also relevant to prioritising control is the result showing several species that are not considered to be very important vectors. These include An. annularis, An. indefinitus and An. vagus (the latter in large numbers in Java) as well as very small numbers of An. flavirostris, An. kochi and An. tesselatus. The results at a species level are consistent with the literature as discussed below. Anopheles aconitus had relatively large numbers in hilly-rice field areas in Java and West Timor. Other studies have shown that An. aconitus is a malaria vector in rice field areas [8, 12, 13, 19, 27–30]. This species is associated with shallow water depths, higher water temperatures, higher acidity and salinity concentrations . Anopheles aconitus was confirmed as the main malaria vector in Java and Sumatra [29, 31]. It is also a malaria vector in the endemic area of Kokap, Yogyakarta [10, 23] and in the Manoreh hills areas  and was found also in Bali . There were relatively few An. annularis captured and they were associated with hilly-rice fields, especially in Java. This is similar to other research that found An. annularis associated with rice fields, swamps and vegetated pits [28, 32]. Noerhadi  noted that An. annularis was one of the most difficult Anopheles species to find. An. annularis was also found in Lampung; however it has not been yet confirmed as a malaria vector in the area . Ompusungu et al  found that An. annularis was not a potential malaria vector in Flores, Nusa Tenggara Timor. Anopheles barbirostris was was significant as a coastal specialist in West Timor, whereas it favoured highlands in Java. This is consistent with other research. It has been confirmed as a malaria vector in NTT , Sulawesi , Bali , the Thousand Islands of Jakarta , Banten (west Java) and Nias north Sumatra) , and Lampung . An. barbirostris breeds in swampy rice fields, swamps, lagoons, and fresh water fishponds, neglected fishponds, drainage ditches and rivers [5, 28, 29, 38]. Anopheles barbirostris has also been found associated with higher elevations, rice areas, relatively shallow water depths, higher water temperatures, higher acidity and salinity concentrations, and a greater average distance from human habitation [20, 39] and the Manoreh hills of Central Java . Only four An. flavirostris were captured, and only in the hilly rice fields in Java. It has not been reported as a potential malaria vectors in this area as well as in other areas. For example, it was confirmed as a malaria vector in Sulawesi island in 1949 . In Sikka, Flores, however, the density of this species was too small to transmit malaria  and this may well be true in Java, based on this study. Anopheles indefinitus was caught only in hilly-rice field areas in Java. However, it has not been confirmed as a malaria vector in Indonesia. Anopheles indefinitus is associated with grassy pools, ponds and ditches . In Sikka, Flores, An. indefinitus was found in rice fields and lagoons but in limited numbers only, and in places with low population density . Both the rice field associations and low numbers are consistent with the present research. Anopheles kochi has mostly been found in Sumatra and Sulawasi [29, 37, 40] and Halmahera island, North Maluku  but it has never been found to be infectious . Anopheles kochi is not considered to be a malaria vector in Java. Anopheles maculatus was the dominant species in the coastal area of Java in this study. It has a wide distribution in Indonesia including Sumatra, Java, Kalimantan, Bali and Nusa Tenggara Timor islands [29, 38, 40]. Anopheles maculatus is an important species in open hilly areas, in cleared mountain forest areas  and in forested hills such as in Central Java [13, 22]. Its breeding sites include sunlit puddles in streambeds and along the slow running edges of streams, ditches, rice fields, or close to hilly areas [22, 29]. Its presence is also associated with seepage springs, pools and stagnant water in cattle footprints . Anopheles subpictus was the main Anopheles species in coastal areas of West Timor and, in fewer numbers, in hilly-rice fields in Java. 72% of this species was caught in coastal areas. Anopheles subpictus has been known to be a malaria vector in Nusa Tenggara Timor Province since 1975 [30, 34]. It is widely distributed across Sumatra, Java, Sulawesi, Bali and Nusa Tenggara Timor [10, 11, 29, 40, 42, 43]. In Sikka-Flores Island (NTT) districts, Anopheles subpictus is associated with coastal areas, mainly in mangroves, lagoons, brackish water and river estuaries which have direct sunlight [28, 30, 42]. Similarly, in the Thousand Island District of Jakarta, An. subpictus appeared to be one of the dominant malaria vectors, associated with mangroves and fishponds . Since it is ubiquitous, An. subpictus may occur in great density and account for a great amount of malaria . Thus, An. subpictus is one of the vectors that needs to be properly controlled to reduce malaria transmission. Very few An. sundaicus were caught, and were entirely in coastal areas, consistent with the findings of others such as Muir  who found that on the south coast of Java, artificial fishponds along the edge of relatively calm water were potential An. sundaicus sites. Anopheles sundaicus is widely distributed in Indonesia's islands of Sumatra, Java, Kalimantan, Bali and Nusa Tenggara Timor, but is not so widely found in Maluku and Papua [8, 12, 29, 31, 40, 42–44]. It is a significant malaria vector in Indonesia [29, 44] and is important in coastal areas [5, 8, 11, 13, 19, 42, 44, 45]. There were very few An. tesselatus caught in the present study. Anopheles tesselatus has been found in Nias island, North Sumatra . It breeds in rice fields, shaded pools, forests, swamps and fresh water fishponds [3, 40] and drains with particularly heavy shade . It is not a confirmed malaria vector . Anopheles vagus was one of the most frequently captured mosquitos (37% of the total catch). It was in all topographic settings in West Timor, but it was predominantly a hilly-rice field species in Java. This is consistent with research in Sikka, Flores, in which An. vagus was found in almost all types of breeding places: lagoons, rice fields, rivers and stagnant water . Anopheles vagus has also been found in the Manoreh hills of Central Java . It occurs widely: in small and open muddy ponds, in animal footprints or in brackish water. Sandosham and Thomas also confirmed that An. vagus was endemic everywhere in coastal, hilly and highlands areas . In Java, An. vagus was associated with lower elevation fields, deeper and cooler water, and less acidic and saline conditions . Other anophelines that have been recognised to be the main vectors of malaria in Papua such as Anopheles punctulatus, An. farauti and An. koliensis [16, 17] were not captured in West Timor or Java during this study. This shows that these Australian anophelines may have a distribution restricted to Papua and Maluku islands. This study has extended knowledge on significant malaria vectors and their distribution in both West Timor and Java. It has shown that the vectors are distributed differently in different areas and topographic settings. Anopheles annularis is an important species in both West Timor and Java. Anopheles maculatus is a potential malaria vector in highland areas of West Timor but in Java it is a coastal malaria vector. Anopheles subpictus was also found in contrasting habitats: in West Timor it was a coastal species whereas in Java it was associated rice field areas. The ubiquitous malaria vector in both areas is An. 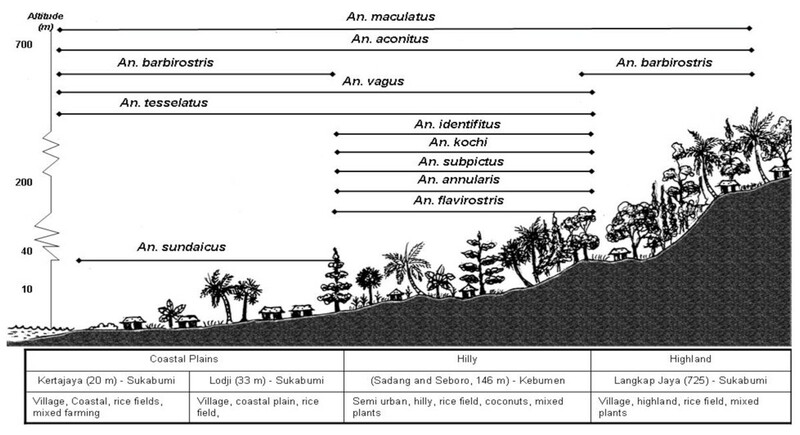 vagus found in all topographical settings in West Timor and in coastal and rice fields areas of Java. These findings are important for malaria management program to help design malaria vector control programs relevant to local characteristics including the vectors and their activity patterns. The results from this study show that each Anopheles species occupied different topographical settings. That there were four highly significant vectors of malaria with different distributions by location and topographic type is information that can be used to inform and prioritize mosquito and malaria management. Thus, in West Timor, An. subpictus is probably the most important species found only (in this research) in the coastal areas with some An. barbirostris. In Java, An. aconitus is important and ubiquitous, though more frequent in hilly areas, as is An. subpictus (though with fewer numbers); in highland areas, An. barbirostris is the main problem species. This information is potentially useful in the mosquito control aspect of malaria management focussing attention on the habitats that harbour the more serious or more numerous vectors of assemblages that together may lead to high incidences of malaria. As discussed above, the management combinations may be planned for a variety of situations: for localized habitats direct intervention by larviciding or creating predator reservoirs may be accost effective option, For widespread species then protection (e.g., bed nets, screening) is likely to be cost-effective,. The role of public information is also important so that people can plan activities to minimize risk of contact with disease vector mosquitoes. This needs information not only on the vector habitats but also on diurnal mosquito activity patterns, which is the subject of another paper. This research was supported by an Australian Research Council Discovery Grant (DP 0558908). The assistance of advisers in Indonesia: Prof. Sugeng Mardihusodo (Gadjah Mada University, Dr. Damar Tri Boewono (Vector and Disease Reservoirs Research Center, Salatiga - Central Java). The entomologists: Agus Samol (West Timor), Trisuwaryono and Mujiyono (Salatiga), Maman Surjaman (Sukabumi, West Java). Field assistance from Nusa Tenggara Timor Provincial Health Office - in West Timor, Sukabumi District Health Office - West Java, Kebumen District Health Office - Central Java are much appreciated. ED carried out all the field work and most of the data analysis. CW provided entomological and editorial advice. PD participated in the design and implementation of the research and provided editorial assistance. NS participated in the design and implementation of the research and provided editorial assistance. MD participated in the design and implementation of the research and provided advice on analysis.